The Washington State Department of Health said today, January 22, 2014, that the flu has reached its peak, with 19 lab-confirmed flu deaths being reported state-wide since December. Only lab-confirmed flu deaths are reportable in Washington, and with many cases not lab tested, the actual toll of flu is likely higher. The flu virus is widespread in Washington. Most confirmed flu cases here and nation-wide continue to be 2009 H1N1 strain, or swine flu, which is covered by this year’s flu vaccine. A flu vaccination is recommended for everyone six months and older. but especially for young children, pregnant women, people 65 and older and people who suffer from asthma, heart disease, diabetes and neurologic conditions. Nationally, November estimates showed that less than 40 percent of the population had been vaccinated against flu, leaving a lot of people unprotected. In order best protect communities and their residents from the flu, the Department of Health says 80 percent or more must be vaccinated, which is also the national goal. If you haven’t gotten your flu vaccine, experts say now is the time – that it’s not too late. It takes two weeks after vaccination to be protected and experts expect the flu to circulate in Washington for several more weeks. Symptoms of the flu include a fever (often high), cough, sore throat, runny nose, body aches and fatigue. 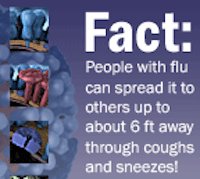 Prescription, antiviral medications can help, such as Tamiflu. They work best if started within two days of getting sick, but can still help even if started later. Healthcare providers in the Snoqualmie Valley report they have seen positive flu cases. The Snoqualmie Valley School District recommends keeping kids home when symptoms of the flu present. They also ask parents to notify their child’s school in the case of a positive flu test, as they keep in contact with the King County Health Department during flu season.